Author’s Note: Some links have been added since publication, as websites have been updated. At long last, the ORCA LIFT program goes into effect Sunday, March 1. Those who obtained a low-income ORCA card, also known as the LIFT card, will start to enjoy $1.50 trips on King County Metro buses regardless of time of day or crossing zone lines, $1.50 trips on the South Lake Union Streetcar, and $1.50 trips on Link Light Rail regardless of distance traveled. Getting that rate requires using the ORCA LIFT card, but comes with a 2-hour transfer on the value of the trip. Or, LIFT holders can get a monthly pass for $54 for unlimited rides on these three services. Kitsap Transit‘s low-income fare remains $1 on both buses and ferries. The Kitsap and King County low-income ORCA are interchangeable for purposes of all the low-income fares. 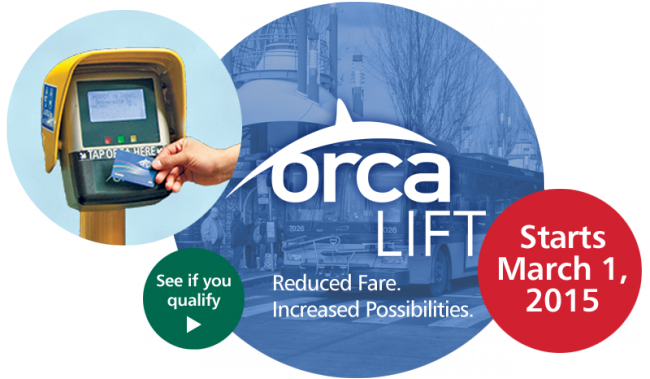 ORCA LIFT cards will be charged the regular adult fare on all other services. Thank you to King County Metro Transit, the Seattle Department of Transportation, Sound Transit, Kitsap Transit, and Public Health – King County for helping to get the farebox out of the way of low-income riders and out of the way of the buses. Here is a full list of fares for all categories of payers for the various public transit services that accept ORCA as of March 1. We aren’t planning on having a group ride, since those are traditionally for new services, but we hope to have a meet-up very soon. Please post your experiences with the new LIFT card, and help us work out any bugs. Metro should give the monthly cards max publicity. I’ve been getting monthly passes for many years, partly because of very large amount of money saved, but also for the unbelievable convenience of not having to sweat or mess with change.Which also, honestly, tended to tear holes in the pockets of my jeans and jackets. I wonder how much extra money the system would get if my $54 Senior ORCA card cost six dollars more- and even two dollars a day? Especially if this could leave more money for people honestly worse off than I am. Or- enough extra to remove the last excuse for the idiotic lack of any All Day Pass- including an ORCA card loaded with the pass, available at Sea-Tac arrival area, upon request and showing an airline ticket for an arriving flight. Chalk it up to Marketing. Maybe the Chamber of Commerce would also contribute for same reason. Lift Pass announced here could also include some advice about E-Purse. Since I generally cross county lines, and often ride Sounder, I keep about thirty five dollars in my account- but have never run through it. But passengers affected here might benefit from help finding out E-Purse amount best for their own travel month. Oh, just rembered to ask: Does All Day pass already exist, and I’ve just missed it because I’m old? You young people just don’t realize…! If you feel money burning a hole in your pocket, you are always welcome to buy a higher pass value (and worry less about the e-purse). By doing so, you are increasing the weight of your vote for investment in the services you ride, by improving their fare recovery performance measurement. There was that $9 day pass trial which ended with no results. I’ve been having a hard time getting a Senior ORCA card for my dad. I see him on weekends so I can’t go to the King Street customer service center. And the Westlake center is only open the first and last four days of the month (today, but of course I didn’t think of it until too late). There are various outreach events, but usually during the week and he has a full time job. They will have a bunch of outreach events to kick the LIFT card off, but for people who are not involved with Public Health already it is going to be difficult to get one of these cards without taking time off work to do the paperwork. You can apply for the senior RRFP by mail. The disability RRFP requires an in-person visit. The youth ORCA is also obtainable by mail. This is exactly the problem. I can get an RRFP by mail or a youth ORCA card. But, I cannot get a Senior ORCA card by mail. Or, this new disabled ORCA LIFT card by mail. These require going in to one of these customer service centers with inconvenient hours or figuring out an outreach event. I think a lot more people who qualify for these ORCA cards would get them if they were easier to get. Either by making customer service centers be open evenings or weekends. Or, by allowing all the different ORCA cards to be ordered by mail. Seniors may trade in their old Regional Reduced Fare Permits at our Customer Information Offices and ORCA To-Go mobile sales events. It sounds like the process is to apply for the permit by mail; when it arrives, send it back and they’ll send you ORCA. You could also look for an ORCA to go event. The senior RRFP ORCA *is* the senior ORCA, in case that wasn’t clear. Also, there is no “disabled ORCA LIFT” card, unless you are talking about a card that has been disabled. I’m using my story to illustrate the problem. It sounds like the new process is to mail in for one permit and then mail that in for an ORCA card. Does that make sense to anybody? No, it doesn’t make sense. That’s why it isn’t done that way. The reason the card exchange still shows there is that some people still have the pre-ORCA version of the RRFP from 2009 or earlier. If you apply for a senior RRFP now, what you will get is a senior ORCA. The non-ORCA version is no longer offered. They could have made that more clear on the webpage. Why are we thanking Metro and Sound Transit? We should be thanking the tax payers that are footing the bill for all of this. I am not at all against a reduced fare for those truly in need (so long as they have to reapply every year), but lets please acknowledge that welfare programs are paid for by the tax payers–not by government agencies, non-profits, or do-gooders. Thank you to taxpayers for footing the bill for subsidized fares for everyone who rides the bus, and subsidized driving on all the public roads. Thank you especially for those paying the highest portion of their income to pay for the transit subsidies (the poor), since the primary funding source is sales tax. “We should be thanking the tax payers that are footing the bill for all of this.” You’re welcome. The link to questions on the Lift Card is pretty vague on what ‘Income’ is. Earned Income, Adjusted Gross Income from a tax return, All Income from any source (SS, Interest, Gifts, etc). The website just says household income. Anyone know the short answer? Gross income. You are right that it should be more explicit everywhere. Before going in person to apply for the ORCA LIFT, I encourage anyone who will be applying to check out the Washington Connections website, which can quickly tell you a list of programs for which you might be eligible, and help you apply for some of them online. There’s an article on LIFT in the NY Times today. I wish the other press would be more forthcoming about the lack of discount on ST Express buses and the Sounder which is where I spend the bulk of my transit fare. LIFTholders may not be getting a discount, but every other category is getting a good deal on ST Express relative to Metro fares and CT commuter fares. The full list of current fares is linked in the post. CT’s adult fares will go up again this summer, further widening the gap. ST staff predicted it would only be a few hundred riders from outside King County who would benefit from honoring LIFT on ST Express and Sounder. They were concerned ST would have to set up a way to qualify riders in Pierce and Snohomish County. But really, anyone from Pierce or Snohomish can get to Metro’s front office at 201 S. Jackson St on the all-day 512 or 594. Residence is not a requirement. The YWCA of Snohomish County (with sites in Lynnwood and Everett) also does LIFT qualification. I’ll be very surprised if the Board doesn’t expand LIFT to ST Express and Sounder when the budget comes up this year. Maybe ST wants to see what the impact of LIFT on Link revenues before expanding the program to ST Express and Sounder. Or, speculating in another direction, maybe they’ll expand their acceptance when PT, CT and ET have a low-income fare. I thought it was interesting that the NYT article mentioned low-income fare and fare assistance programs in other areas, but didn’t mention Kitsap Transit’s low-income fare or KC’s former assistance program using tickets. I qualified and received it a few weeks ago. I was told very specifically that I could start using it at any time in February, but it would not start charging the reduced fares until 3/1. Well, I did test it out in February, and I got the new reduced fares. I only used it a few times that way; I am grateful and did not want to take advantage of the system. I was emptying out my previous card, too. For March, I intend to monitor my usage with e-purse and see whether the $54 monthly pass is the way to go. Also, I will be out of town for almost a week in March. I am really grateful for this program. It will make a difference. Also, I live within the Pronto Bike Share prime area, and am a member, so my transportation costs should really go down for 2015. It’s a nice boon. One problem I had was that I could not register the card to my regular Orca account. When I entered the card number, it said “this card is already registered.” Yes that is true, it is a special card that is already registered. But the Lift Pamphlet said you could add value on-line, and so I imagine that there is a way to register your Lift card. I want to monitor my usage, and that is one way to do it. Maybe this problem has been solved or will be solved. It seems pretty basic. A friend got a Lift card downtown on one of the early days they were available. The guy processing it was a bit clueless and apparently didn’t seem to know what he was doing. He gave her a card she couldn’t register herself. I guess he registered it to some other account? She stopped by a week or so later and got it resolved. I have a senior ORCA card which I renew every month for $27. I also keep some funds in e-purse to use when riding the ferry occasionally. When I tapped the card yesterday the reader said ‘Pass plus 25 cents’ instead of just ‘Pass’ as it has done i the past. Am I being charged an extra 25 cents from e-purse each time I ride the bus now? If so, why not raise the price of the monthly pass instead? Funny thing. My senior-citizen mom asked this exact question today. The pass you need to buy has changed — before, it was a 75c face value pass, and now, it is a $1.00 face value pass (which costs $36). So you’ll need to change the pass you’re buying, starting next month. For the month of March, you’ll need to chip in 25c from the e-purse each time you ride. Thanks! Surprised ORCA VM at Westlake didn’t instruct me to do so.